This is one of those cards that is so beautifully coordinated I just can’t pull my eyes away from it. 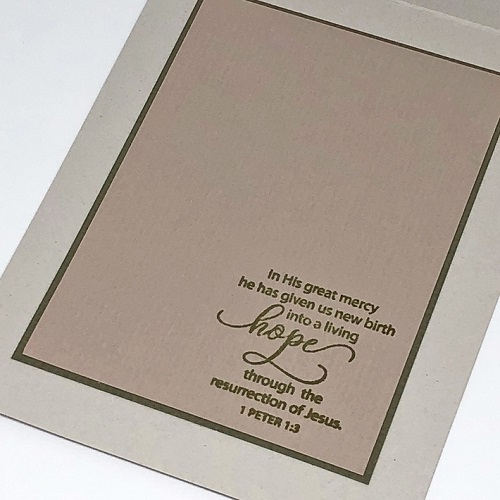 It uses a soft color scheme that I am always so fond of, gorgeous papers, beautiful scripture verses and that cross – oh my! 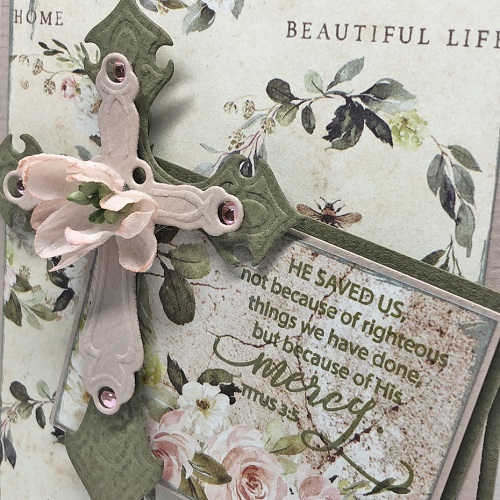 Here’s a better look at the cross – such gorgeous detailing! I love how the verse from scripture is stamped in an ink color to coordinate perfectly with the paper. And stamping the verse right onto the designer paper is always a hit in my book! Love that look!!! The inside scripture verse compliments the verse on the card front so well. Such a beautiful card design, through and through! So many gorgeous elements. 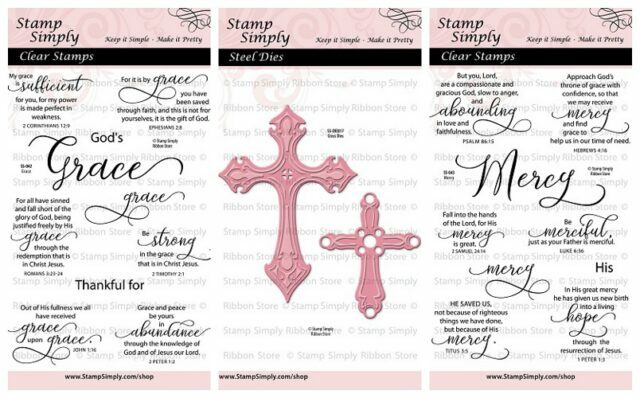 Stamps: Mercy by Stamp Simply Clear Stamps – NEW! 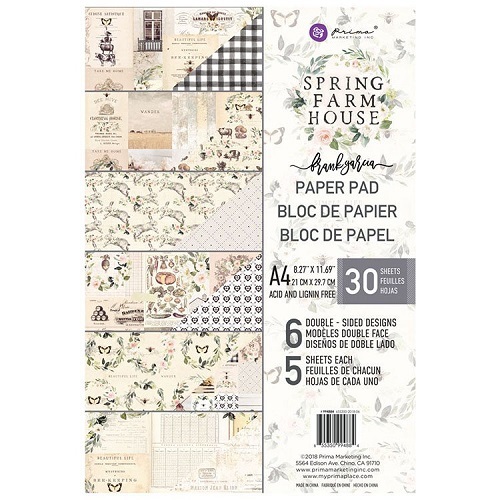 Paper: Spring Farm House by Prima – A4 size – NEW! Ink: Tim Holtz Distress Oxide Ink – Forest Moss, Iced Spruce – REDUCED! Spring Farm House by Prima – A4 size – NEW! This pad has truly captured my heart! 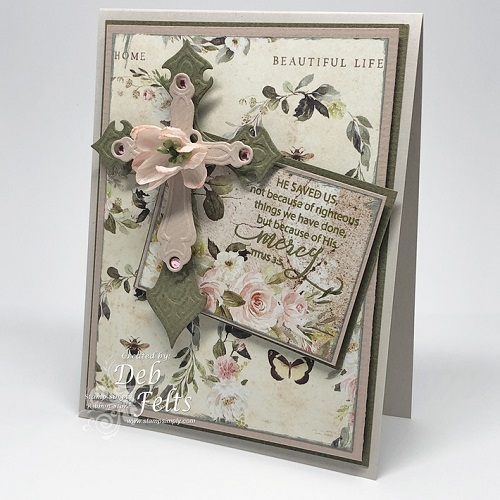 What a gorgeous card, Deb! I love everything, from the pretty papers, to the dies, and to this beautiful sentiments. Thanks for the inspiration! Thanks, Patti! That makes me happy!